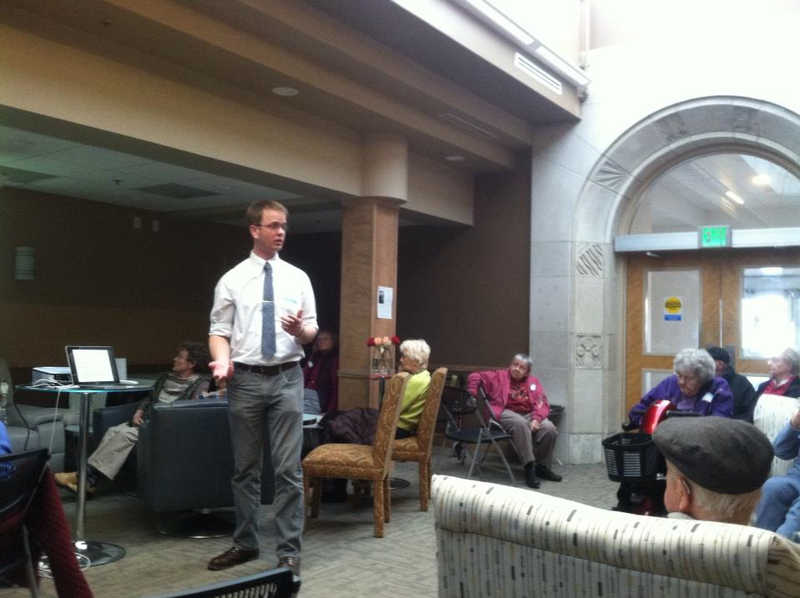 The talk on Art Deco in North Dakota at the Lutheran Social Services Legacy Living in Jamestown, North Dakota. Note the entrance, and the Art Deco ornamentation. Earlier this evening, between 5:30 and 7:00pm (CST), I gladly obliged an invite to present a short talk on Art Deco in North Dakota at Legacy Living in Jamestown, North Dakota. It was a great crowd. The invite came from Lisa Richmond, a coordinator of housing for Lutheran Social Services in said North Dakota (note: thus far, Lutheran Social Services is the only contender when it comes to providing affordable housing in the #2-oil producing state that is the NASA-space visible Bakken of western North Dakota). So over the past couple days, or even week, I’ve been thinking about how to think about today’s vertical and horizontal strip mall culture. Fellow blogger and friend Bill Caraher had some great at-length thoughts the other day on the psychological a-spatial and a-temporal feeling one gets while in a modern airport and a man camp. It is safe to say that we, and laborers staying in these camps, totally know what he is talking about. In any case, while looking at a small sample of architecture in North Dakota from 1912 to the mid-1930s, I noticed how yesterday’s architects and engineers started to increasingly do away with regional or national ornamentation. I sampled the exteriors of the Dickey County Courthouse, built from 1910-1912; the Crystal Springs (ND) Progressive Schoolhouse, built in 1920; and the Art Deco airport hangar built by the WPA/CCC in the mid-1930s at the Bismarck Airport, in Bismarck, ND. To give a visual of what I’m talking about, check out the three photos below, and note how with each passing decade, there is less and less ornamentation. So in 1912, the Dickey County Courthouse has cupola ornamentation, which by 1920 is done away with in the construction of the Crystal Spring Progressive School, and even moreso with the 1930s Art Deco of the hangar in Bismarck (and certainly the state capitol of North Dakota). 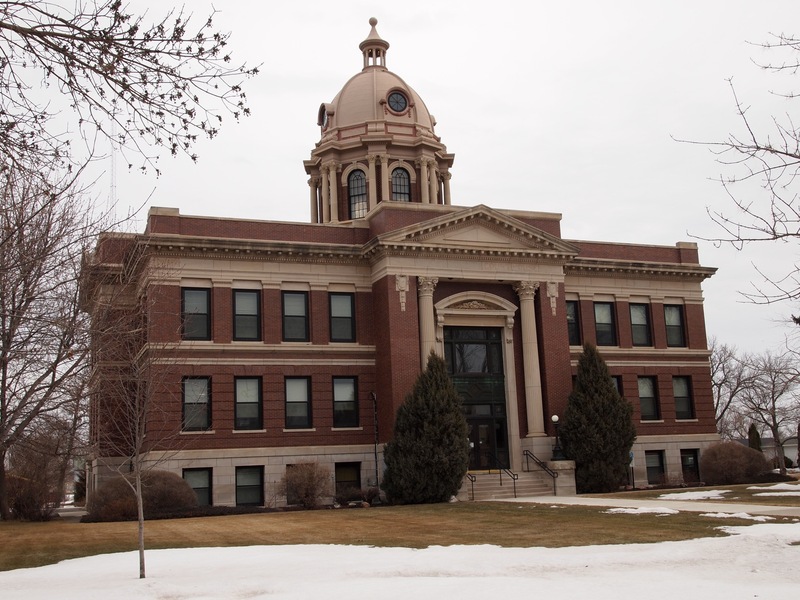 1912: An April 2013 photo of the Dickey County Courthouse built from 1910-1912 in Ellendale, North Dakota. Above is one of the 12 Buechner and Orth-style courthouses throughout North Dakota, designed by the German-Norwegian architect duo out of St. Paul, Minnesota (my running joke is that they first created the sauerkraut wrapped in lefse snack before creating the above). Now note below, the 1920 Progressive Schoolhouse (abandoned historic archaeology) in North Dakota, a style that trends more toward a Commercial brick aesthetic, and that has much more subtle neo-Classicism and done away with cupolas. 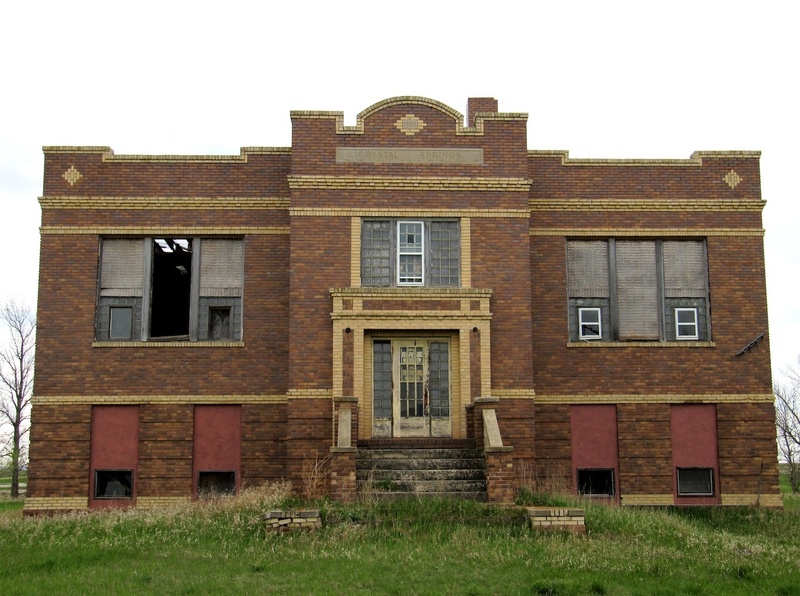 The west elevation of the 1920 Progressive School in Crystal Springs, North Dakota. And from 1920, we turn toward the Art Deco of the 1930s, a style started in 1925, and one that could get away with non-ornamentation (especially in the global Depression of that decade). 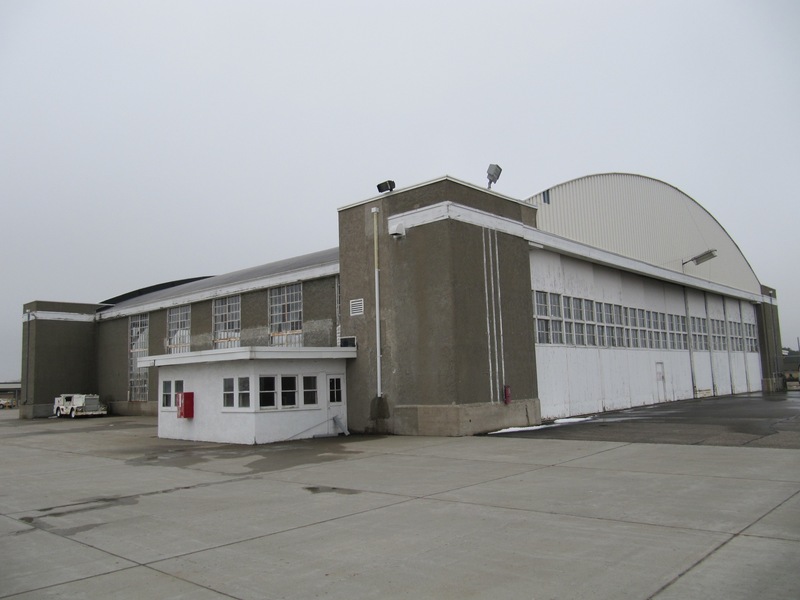 The Art Deco Hangar built by the WPA/CCC in the 1930s at the Bismarck Airport. 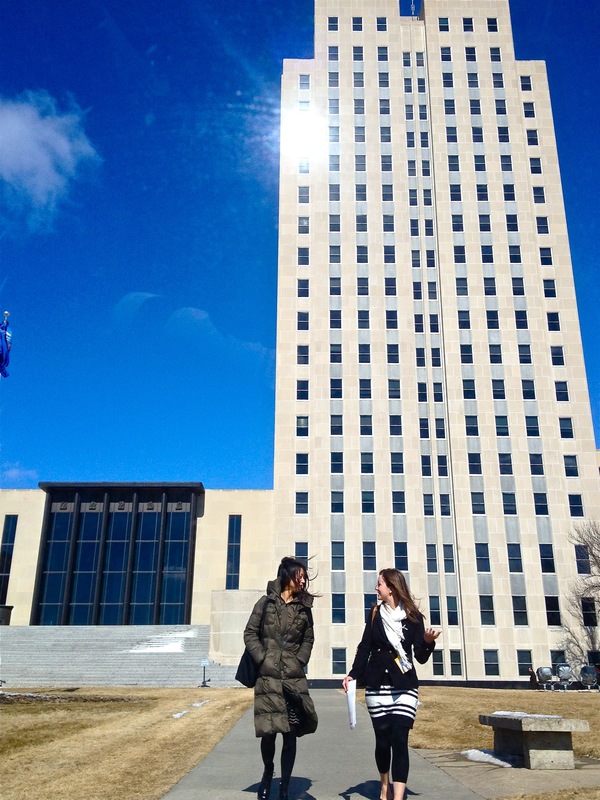 The state capitol in Bismarck, North Dakota, with two North Dakota citizens in the foreground. This entry was posted on Thursday, April 18th, 2013 at 10:57 pm	and tagged with Art Deco, North Dakota and posted in Uncategorized. You can follow any responses to this entry through the RSS 2.0 feed.